In honor of International Podcast Day, I went to the local mall (that's still open) and asked people, “Have you have of podcasting?” If they said yes I would ask, “Have you actually heard a podcast?” Many people said NO. The people who had been listening to podcasts were really into podcasting. I've been nominated NUMEROUS times for the different shows I create such a the Logical Weight Loss Podcast, Feeding My Faith, and others, but I've never won an award. 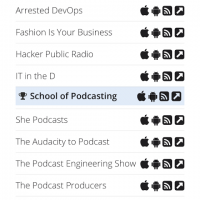 The School of Podcasting won this year in the technology category. Thanks so all of my listeners. It is DEEPLY Appreciated. Douglas from Zerobooks.com got a job, and is now podcasting as part of this job! Check him out at www.zerobooks.com His podcast is called Zero Squared. I went to the mall to ask random people if they knew about podcasts? Most people had not heard of podcasting, those who had listened to a podcast, really loved them. There are some people who need some help in understanding what a podcast is. If took me 40 minutes to get up the nerve to talk to complete strangers. I may appear outgoing, but underneath I can be pretty shy. As I moved along, it got easier. It was funny watching people put up their guard when I would ask, “Can I talk to you for a few minutes?” You can see their defenses go up. If I do this next year I need to find people who are bored (laundromats, or maybe set up a table at an Apple store). I'm not sure if Apple would allow this, but all they can say is no. I had a talk this week with a potential podcaster who wants to build an audience and monetize his podcast. He wanted a step by step approach that would ensure that he was making a full-time living in the future. While there are people out there who are happy to charge you $4000 to tell you to believe in yourself, get into New and Noteworthy, and your dreams can come true, I prefer a more realistic approach. That is to say Gimlet Media producers super popular shows, and yet not every show they launch makes the cut a few months later. There are great shows like Action that was on a major network with A-list celebrities making appearances and yet the show was canceled. You can follow their footsteps and do a pilot episode, get feedback and shape your content accordingly. In the same way, you can't practice comedy in a basement (you have to tell your jokes in public to know if they are funny) you need to publish your episodes to the audience to get feedback. Even if your show doesn't end up doing as well as you had hoped, you will gain new friends, you will learn new skills, and you will benefit from the experience (I've had people say they are better speakers due to creating a podcast). My podcast is not displaying properly – This is almost always a case where you are exporting your podcast using a Variable Bit Rate (VBR). This will cause the episode to not display properly, and in some cases, if you press pause, and the podcast goes back to the beginning when you press play again. One strategy is to go to imdb.com and use their 30-day free trial to get the information on actors, directors, producers, for your show. I wrote an article about free media hosting on my blog and in it I look at six different podcast media hosting that have gone out of business. It turns out that the average lifespan of a podcast media hosting company that does not charge is 31 months. I do not recommend free media hosting for your podcast. 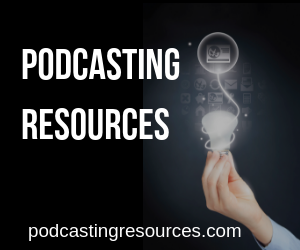 It is building your podcast on very thin ice. How Much Storage Space Do I Need For My Podcast? My first reaction to Dave’s finding that a lot of people in the street weren’t into podcasting was disappointment until I reflected on the fact that this meant there was a big audience just waiting in the wings to discover podcasting. So that’s great news!